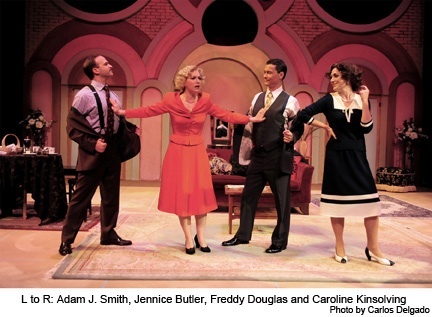 Noel Coward’s “Private Lives”– Just How Private? In the International City Theater’s light-hearted production of “Private Lives,” divorced couple Elyot and Amanda cannot seem to live with-or without- each another. Caroline Kinsolving embodied the headstrong, alluring Amanda while Freddy Douglass portrayed the witty, brooding Elyot Chase. The glamorous costumes and music in the ICT production enhanced the accidental reunion of the jet-setting pair in Deauville, France. Elyot and Amanda go from loving each other one minute to throwing barbs (and records) at each other the next. Adam J. Smith‘s sensitive performance as Amanda’s caring second husband Victor infused a dose of integrity to the chaos; despite being ditched by the runaway bride, he returned to ensure her safety. Underneath the veneer of biting wit and tumultuous emotions, one could not help but feel that something was missing- not from ICT’s production- but from Coward’s play itself. Looking at the play from a historical perspective, Mr. Coward was a homosexual at a time in which he would have been jailed had his private life been made public. Had Elyot and Amanda been gay characters, many of the play’s scenes would have made more sense and had more depth. For instance, Elyot’s affectionate young bride, Sibyl (Jennice Butler) begs him three times on their honeymoon to kiss her; he forces himself to do so reluctantly. Later, when accused of being too flippant, Elyot retorts that his flippancy masks deeper emotions. Perhaps the flippancy of Coward’s lines also masked a more complex subtext. But, Coward was no coward. His predecessor Oscar Wilde died in prison when his private life was revealed. Private Lives proves that in the 1930’s England one could only go so far in exploring the truly private.